My first solo exhibition opened Saturday, August 19, 2017 with a steady flow of well-wishers, friends, students, and colleagues. Many hours and years went into creating the artwork. The Veils of Time tapestry, (on the left, 60" high x 50" wide) alone took two years and about 1200 hours to complete. 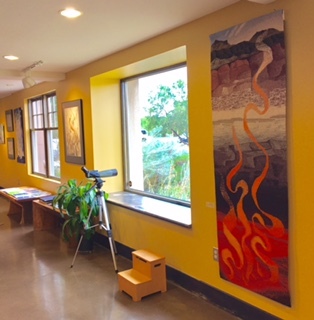 In addition, during the months leading up to the show's installation, I juggled weaving the seven-foot tapestry, Molten Beneath Lava, with teaching, writing press releases and announcements, as well as meeting with the Open Space Center staff to help plan the accompanying educational activities and displays. 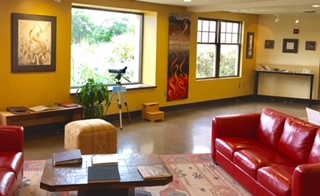 The venue, The City of Albuquerque's Open Space Visitor Center, has a lovely Reception Area Gallery with lots of natural light from the large windows along the north wall. Here visitors often see hummingbirds darting among the high desert flowers growing close by. During the fall and winter months, Sand Hill Cranes and Canadian Geese feed on adjacent fields backdropped by the Sandia Moutains in the distance. The Veils of Time tapestry, Spiral Universe tapestry (top), Prairie Waves drawing (bottom), Fossil, Feather and Light tapestry, Prairie Flight drawing, Prairie Dance drawing. The drawing, Seismic Waves, and the tapestry, Molten Beneath Strata had an ongoing dialogue in their creation. I began sketching Seismic Waves to get the feel of how to describe flame and ribbons of smoke, and left the drawing half-done to begin weaving Molten Beneath Strata. The sett for this tapestry is 6 epi, and I used weft bundles combining rug weight wools, crewel-weight wools, some of my mother's hand-dyed silk, pearl cotton and strips of fabric to create the different textures for each layer of strata. This tapestry took seven months and 475 hours to complete, January through July of 2017. The week it was resting from being under tension, I finished drawing Seismic Waves. The New Mexico Natural History Museum loaned some of its fossil gastropods and mollusks for this educational display that is beneath the drawings and tapestries along the east wall. Some of the fossils in the display case. Elizabeth Buckley with drawings: Prairie Flight and Prairie Dance. Saturday, Oct. 7th at 11:00 am: Artist Talk in the Kiva Room.